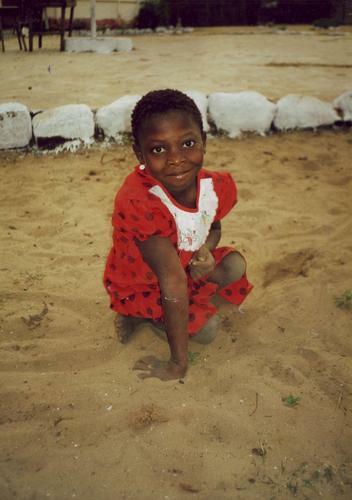 In 1994, while on holiday in Guinea, Marijke Clabbers-Klein and Nelly Klein noticed a girl of about 10 years old moving around on all fours. This was in the fishing village Koukoudee and the girl was Bangoura. At the age of four she had been paralysed by polio. Due to her years of crawling, she could no longer unbend her legs. Marijke and Nellie decided to try and help Bangoura and her family. Accompanied by her mother, Bangoura came with us to the capital, Conakry. We succeeded in arranging an operation during which her legs became unbend. This was also possible due to the financial contribution of our fellow travellers. After the operation, Bangoura was able to walk and stand up straight with the aid of crutches and braces, and after a long time of revalidation. After a life time of crawling on all fours, this made all the difference.